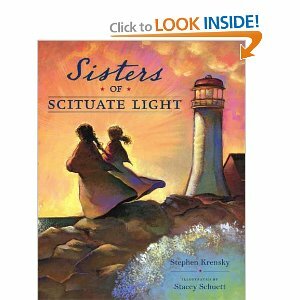 Summary: Sisters of Scituate Light is the true and heroic tale of two sisters, Rebecca, age twenty-one and Abigail, age seventeen, who singlehandedly (or should I say double handedly?) thwarted an attempted attack on the tiny community of Scituate along the southern coastline of Boston by the British navy during The War of 1812. Trained by their father to run the twenty-five foot high lighthouse, the two girls were left behind to aid passing ships while the rest of the family left for a short trip. The girls spent most of their time cooking and cleaning until one night when a British warship arrived to raid the docks. Determined to do something, the girls devised a clever ruse to deceive the attempting marauders into thinking that American soldiers were gathering and readying to fight back! Literary Elements at Work: There are three important literary elements at work in this story: artistry, language and the remarkable tale of heroism and creativity displayed by the Bate sisters! The paintings throughout this book are important to set the period context. Ms. Stacey Schuett uses period dress, landscaping, housing, ships, and other everyday common items consistently throughout this narrative, taking the reader/listener back to the early nineteenth century. Ms. Schuett’s facial expressions, use of color, and scene context provide an attentive engagement with the emotion and drama of the sisters’ story as well as a thoughtful interpretation of the historical narrative Stephen Krensky tells. Stephen Krensky renders the story of the Bate girls’ lives, beginning with a typical day of work for the entire Bate family and concluding with their harrowing, while at the same time victorious engagement with the British navy. Peppered throughout this historical narrative is uncommon language, language children do not often hear, making this a fun, almost game-like story with which to discuss words!! For example, Mr. Krensky uses the words nary, call the roll, afore, and fife. Additionally, the sisters construct the most clever and imaginative ruse to frustrate their would-be assailants. Armed only with fife, drum and wit, crouched and shivering behind a stand of trees, clad only in nightgowns, the two sisters dupe the well-seasoned soldiers into believing that the American army is mustering for duty. Mr. Krensky’s depiction and the Bate girls’ ingenuity and cunning gives voice to the truth: young women are courageous, creative and a vital part of ANY community whether it is military, business, political, neighborhood, family, faith, etc. Theology: It is clear from the beginning of the Bible to the end of the Bible that God has created us and creates us (all of us, men and women alike) as equals. This is evidenced in the Old and New Testaments. God created and creates men and women in the image of God and breathes the breath of life into humanity’s nostrils. That is why we find Deborah sitting under a palm tree (the posture of a teacher), judging (the position of a charismatic military leader) the people of Israel. Sisters of Scituate Light by Storypath is licensed under a Creative Commons Attribution-NonCommercial 4.0 International License.